This helicopter looked like exact copy of S-51, though Yak insisted OKB team, under Erlikh, merely reached similar design conclusions. Complete reversal of original scheme, this single-rotor machine did retain similar dynamic parts, drive and hub mechanism with damped flapping, feathering and drag hinges and hydraulic-dashpot control via swashplate. Three main blades of hardwood and pine as before, with ply skin and glued fabric overall. Root of each blade in upper/lower halves of bolted D1, steel hub. Main change in engine installation was vertical engine mount with several changes to enable engine to run in this attitude. Cooling fan, clutch/freewheel and reduction gear and angle box for tail rotor were more Sikorsky than scaled-up EG, though pilot controls and control system retained OKB belief in spring and oil vibration dampers (this time with pilot adjustment) and in spring-loaded actuation of pitch into autorotation following loss of drive torque. Pedal control of tail-rotor pitch. Airframe based on welded steel-tube frame carrying landing gear, seats, rotor hub and engine. Skin riveted D1, and cranked tailboom D1 monocoque. Basic design completed late 1947 as tandem trainer or as transport with single pilot in front and two-seat divan or other payload behind. Two prototypes built, first with VVS funds and bearing VVS insignia. Began factory test Nov 1948, initially suffered from severe vibration and apparent blade flutter. Blades given ground-adjustable TE tabs and eventually modified with CG further aft, behind flexural axis. These blades first fitted to No.2 Yak-100, which began test July 1949. Factory test complete June 1950 and NII tests successfully accomplished later same year, but Mi-1 already adopted and Yak-100 lost by being later. 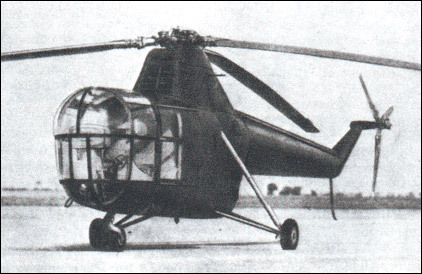 Having learned a great deal with the Sh, Yakovlev ordered the development of a practical helicopter capable of being built in two forms, as a transport carrying a pilot and two passengers, or equivalent cargo, and as a two-seat, dual-control trainer. Design began in June 1947, this machine being one of several which were given out-of-sequence type numbers (others included the Yak-200 and Yak-1000). The Yak-100 appeared to be a copy of the Sikorsky S-51, but Yakovlev said that the resemblance was superficial. The engine was Ivchyenko's AI-26 seven-cylinder radial, the version chosen being the 575hp AI-26GRFL designed to operate with crankshaft vertical. This drove via a cooling fan and centrifugal clutch to a main gearbox which turned the single main rotor at 232 (not 233) rpm, with a bevel drive to a shaft carried on external trunnions along the top of the long tail boom to a 2.6m three-blade tail rotor. The latter counteracted the main-rotor drive torque and provided yaw (directional) control, driven by pedals. Both rotors were again of fabric-skinned wood laminates, the main rotor having manual control via swash-plates, with spring-loaded automatic autorotative control following loss of drive torque. The fuselage was again based on a welded-tube truss, with unstressed D1 skin, but the tail boom was a D1 semi-monocoque. The main gearbox was housed in a large mast fairing above the engine compartment, with a front air inlet for the fan-assisted oil cooler. Again the undercarriage was a simple tricycle, with a castoring levered-suspension nosewheel and triangular-braced main units with oleo shock struts pinned to the upper longerons. Track was 3m and wheelbase 2.865m. The entire front of the fuselage was transparent, with sliding doors on the right for the pilot and on the left for the backseater (who had dual control in the first prototype). The transport version was to have a two-seat divan at the rear. The first prototype was tested from November 1948. Gradually problems with vibration and flutter were solved, and a second prototype was built with modified blades with the cg behind the flexural axis which greatly improved behaviour without complicated damper systems. This dubler, first flown in July 1949, had a more-fully enclosed engine bay with grilled panels and an internally mounted tail-rotor drive shaft. NII-VVS testing took place in the second half of 1950. According to the OKB the test team and a State commission recommended series production, 'but the government decided on the Mi-1'. No ASCC name is known. The Yak-100 was developed in competition with the Mi-1, and bore a striking resemblance in size, shape and weight to the American Sikorsky S-51. It did not enter production, however, and in fact Yak-100 was the design bureau's designation, not that of the armed forces. A second prototype of the Yak-100 flew in 1949 and the two helicopters were tested until June 1950, when it was decided to drop the project. 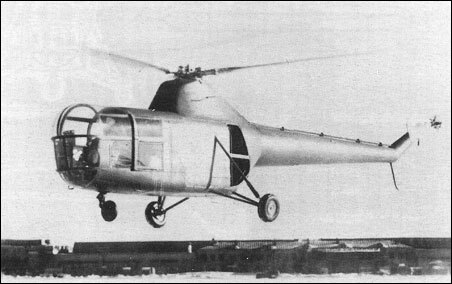 The second Yakovlev's helicopter, using a conventional scheme with one main rotor and tail rotor for control and stability. Two prototypes built, test passed completely in 1950. But at the time extremely successful Mi-1 was already in production, and Yak-100 project was closed. when it was decided to drop the project.